Vaango: An unforgettable gateway to the magical kitchens of South India. Literally meaning 'Come in', 'Vaango' is the quintessential Tamilian way of welcoming guests. Said with a gentle forward bob of the head, a smile and a folded-palm namaskaar, it is the gateway to the magical handiwork of masterchefs of South of India who have made their cuisine amongst the truly greats of our time. 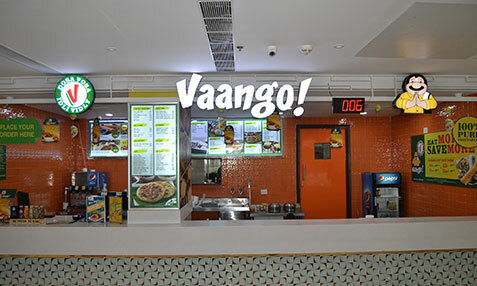 A much loved, world class South Indian Pure Veg QSR (Quick Service Restaurants) chain with a distinct personality and welcoming ambience, it is Vaango's mission to delight our patrons not just with great flavours, but also the freshest ingredients possible in ultra-modern kitchens. Vaango is specially known for its trendy offerings and innovations. We are constantly expanding our product portfolio, and our range will soon feature never-before dishes and delights such as a new look and appearance, really low preparation time (quicker to make) and longer durability and shelf life. Our fast-expanding, pan-India network of stores and outlets are synonymous with warmth and service, offering a charming space for patrons and food-lovers to walk in anytime, get together and celebrate. Our vast experience in the outdoor catering space provides the perfect opportunity for businesses to add variety, hygiene and great taste to special events and occasions. Our take-away and home-delivery lets our fans enjoy the great Vaango experience from the comfort of wherever they are. And our regular offers and innovations add joy & fulfilment to special occasions and celebrations like weddings, anniversaries, birthdays and seasonal moments. Vaango is brought to you by Devyani International Limited, the fastest growing customer centric name in the Indian retail F&B sector, and is the largest franchisee for premier global brands like Pizza Hut, Costa Coffee and KFC.